Macro Man's little corner of the world was supposed to be battered by a tropical storm yesterday, but in fact Labor Day turned out to be sunny and temperate with a hint of a breeze- a perfect late summer's day. While it's often tempting to distill allegorical market references from real world occurrences, if anything the market appeared to do the opposite following Friday's payrolls. Although the mediocre employment figure appeared to send any chance of a September rate hike gently into that good night, the market's eventual decision to act as if battered by an impeding rate hike storm was frankly a little puzzling on the face of it, coming as it did after two consecutive weaker than expected data prints. Of course, the payrolls were not the US data release on Friday- July trade data came in better than expected, which nudged the GDP Now forecast back to 3.5% despite the mediocre employment figures. Then again it's difficult to credit that the bond market, for example, was keying off of trade data. That being said, the short end market remains priced for a 25% chance of a hike this month, which seems broadly reasonable- and also means, given the history of the Fed over the last two decades, that they won't go. Someone might want to tell the oil market, which has been clumped pretty badly recently. On the other hand, GDX has snapped back smartly recently, justifying your author's decision to hang tight. More broadly, however, the lack of an internally consistent market reaction merely speaks to the market's uncertainty about the Fed's reaction function. Yes, it may have shifted in recent weeks given the rhetoric from the power base; however, given the frequency with which they have flip-flopped in the past, one can hardly blame the market for its lack of coherence, given that that's what they're receiving from the authorities. For choice, Macro Man reckons that the FOMC stays on form and skips September given that it's not priced into the short end. As limbs go, that's a pretty small one to climb out on, for sure. he still sees value in short end steepeners, and frankly the flattening throughout the yield curve has been extreme enough to tempt one of take the other side. Then again, given the global grab for yield, it's tough to stand in front of that particular freight train until you see signs that the conductors (Draghi, Kuroda) are looking to change course. Shows how stupid most market participants are. Anyone with even half a brain can see that Central Banks the world over are still cutting rates, and the Fed cannot meaningfully raise rates without bankrupting the US and causing a world-wide depression. There will be no meaningful rate hike in the next 20 years. 2% is the v maximum they could ever go, and it's more likely they raise to a ceiling of 1% then cut rates again. I love the irony of the first post. Most market participants are "stupid" etc and yields have never been lower for a thousand years. I'd rethink the logic if I were you because it looks like this is the consensus view given the market action and the level of leverage still deployed. maybe he was being sarcastic! * "engage irony detector" is sometimes a helpful adjunct to one's shorter and more pithy comments here. LB is making his way back from Europe, where he observed Mangler taking a whooping at the polls in "Meck-Pomm". While this is a tiny fraction of the German electorate, those who are familiar with the "Swing-O-Meter" will know that it does indicate major problems lie ahead for Mutti when the sentiment shift is reflected across Germany. LB hopes nothing happens today, and expects nothing will. Back to watchful waiting and shorting crude later on this week? Not a lot to disagree with MM about in terms of his commentary on September, or bonds, which might still sell off in the weeks ahead. 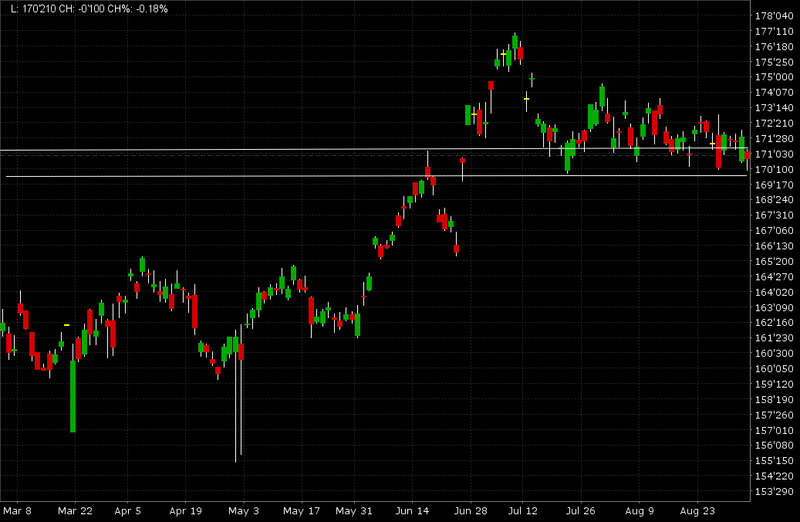 As for Spoos, well with correlations at these levels, they might surprise a few punters by selling off also. LB is going to dig out his yen charts…. if things do go seriously pear-shaped at some point, it will be b/c of unexpected and pronounced yen strength. We prefer to see these things coming before being hit by a large lorry from behind. Can only be described as sarcasm for that first post, otherwise moronic! Did non manufacturing ISM just hit the lowest level since 2010? Looking at ISM, the first Anon post appears right. The Fed targets the stock market. The US equity bull market, IMO is based on low rates, OK corporate earnings, amazing tech earnings, buybacks and PE expansion. Normally the stock market has a very high correlation to PMI's and hence the cyclical business cycle. Macro matters but the more I think, big tech matters just as much. Sure the market shook off AAPL's decline in 2013 and last year but if tech starts missing it will be one more hurdle to climb. And now its not just for US, but look at EEM, 6 out of top 10 are tech. All up big in the past 3 sessions. First comment here. Funny about USU16. I also still prefer that to USZ16 as the windup is much clearer from that high on July 10th to the low of July 21st and everything since then has been lower highs and roughly same lows. Momentum gurus are looking for 30 year to break down in price after an aborted blowoff top. Hasnt happened yet though and after the abysmal US data today (NAPM Services, which used to just be disregarded) is back at or above the trend of lower highs. I look at the one year quarterly spreads between ED contracts and they are all down around 12 bips. Which is to say no tightening expected in the next couple of years, maybe one 25bp just for fun in the near term. Definitely not Sep though. The lefty academics on the FOMC do not want to throw any spanner in the works that might upset Queen Hillary. December probably though as Obama will want to be able to say rates were hiked more than once during his terms. @abee - big tech earnings growth is basically a mix of smartphone spend (apple), ad revenue growth (google/FB), overall retail migration to online (amazon). and cloud (MSFT, AMZN) - its really all consumer/retail dependent other than cloud, where there is some structural potential. My point is that there is nothing magical about the revenue growth of big tech the way CNBC would have you believe - as goes US (and to some extent China for Apple) consumer and retail sales, so goes big tech earnings. The US consumer has as usual been the last one to lead the economy, so this is all very typical late cycle stuff, whats new is the marriage of big tech and US consumer fortunes which didn't exist in past bull markets. Under this period of the slow growth in the real economy, the big tech with the amazing growth are basically eating others' lunch: so Macy's, newspaper and TV networks, and other traditional industries suffer. ISM! Seemed clear enough. Sell dollars; buy short-end. 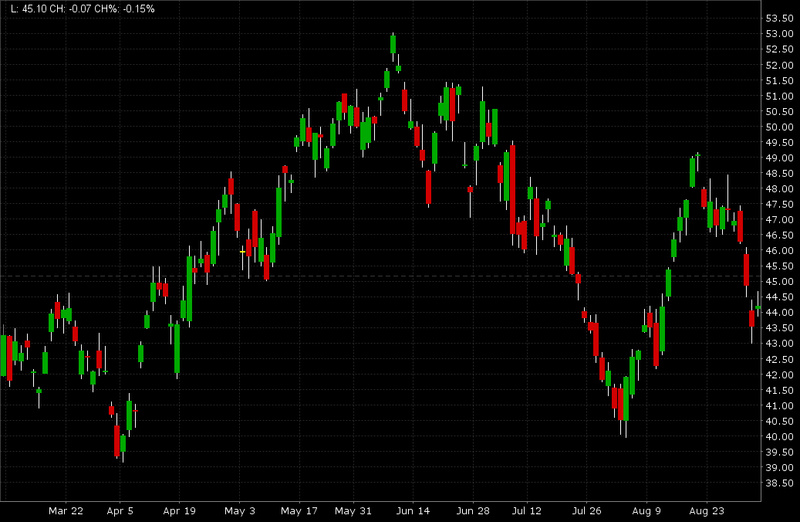 -USDBRL seems an OK candidate. Markets probably give Temer the benefit of the doubt until after the municipal elections. Also, +GBPUSD may have further to go (switched a -EURGBP trade to +GBPUSD). Booked half the profits on Friday shorts on long dollar positions and took the rest off on sunday night before I went off the deep end for the last night in vegas before Monday flight. It turns out, the strength that I saw in USD, which I was so ready to believe in, dissipated by monday... yet I was lucky to turn a decent profit on the trade (got very lucky w/ the timing - otherwise I wouldve broke even on the trade). I doubled my Spooz position (yessir i did), and made a big bet on NZD against the dollar after ISM. I think Spooz is in a pickle here and I like the risk/reward that any potential downdrift narrative can form at this juncture. As for the NZD, Im looking to the dairy auction (8am EST) to propel it higher but even an outlier poor auction wont be able to derail kiwi's move higher. Technically, it's already made a new high last night and at this point, I must respect both the macro and price action. Also given that RBNZ doenst meet until the day after the Fed, this means that as the upward pressure on the USD unwinds further and the expectations for yield differential get prolonged and punted to 2017 (or year 2043...), the flow will continue to propel the kiwi higher. In the short-term, this means, pretty much nothing is really in the way of kiwi grinding higher. I know MM and others have mentioned AUD/NZD... but I think it's still a short. I just dont see too much data upside for the Aussie. I think the easing bias persists despite the hold last night versus RBNZ's dilemma of having to cut just for the sake of keeping the kiwi under the lid as its actual fundamentals dont warrant a cut. In my opinion, cutting to keep TWI checked and pinned to your model is plain stupid - for christ's sake, save it for a rainy day. FMPM, I suspect you're right about AUDNZD. Regressed on rates and terms of trade, it looks mis-priced to me, but I'm guessing now that the rates and/or ToT have to start moving in AUD's favor before that mis-pricing can close. Dairy, as you guess, is probably moving higher and iron ore probably moving lower from here and there's no immediate catalysts for rates, so little reason for AUDNZD to turn around yet.